The results of the research will be presented at the 2017 Australasian Road Safety Conference being held in Perth today. Dr Gregoire Larue, from QUT's Centre for Accident Research & Road Safety - Queensland (CARRS-Q), has found drivers approach level crossings at significantly faster speeds than road intersections. 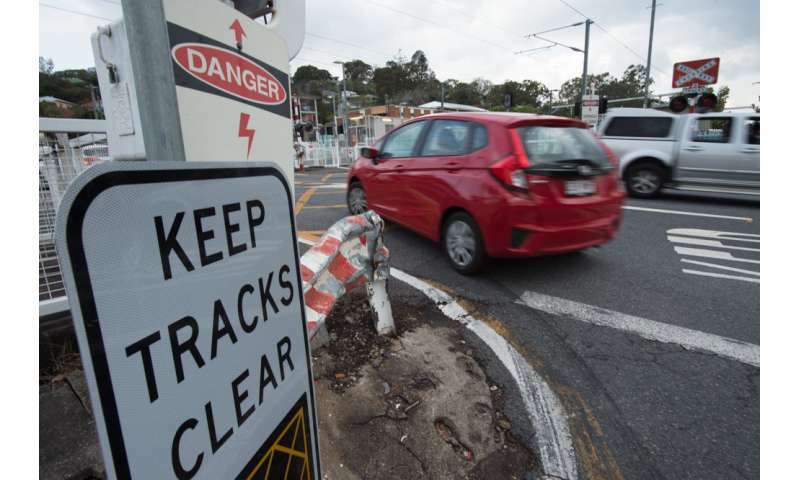 "We saw that drivers were preparing to stop 75 metres before the road intersection but only 30 metres before a level crossing without lights or boom gates," he said. "Drivers were therefore forced to stop much more abruptly at level crossings." Another key finding of the study was that drivers spend a lot less time assessing the situation at a level crossing than they do at a road intersection without traffic. Dr Larue said this meant drivers might not adequately assess whether a train was approaching, given that trains could arrive much faster than cars, and were unable to take evasive action. "The study also found drivers did not appropriately adapt their driving behaviour to the reduced visibility of night-time driving," Dr Larue said. "This suggests that drivers may experience difficulty in recognising the presence of a level crossing, or identifying the actions required for the type of level crossing they are approaching." With about 70 collisions at railway level crossings in Australia each year and most resulting in fatalities, Dr Larue said it was essential to understand driver behaviour when approaching level crossings. "These findings will help guide the design of initiatives to improve safety at level crossings. We should consider developing active advanced warnings for level crossings that don't have lights and boom gates." Do you know the signs of being too sleepy to drive?